Recipient Name(s)*: Name(s) on the certificate. Where you want the certificate sent. Write a special note to the recipient(s) of the certificate. Give the gift of clean air and help stop acid rain! 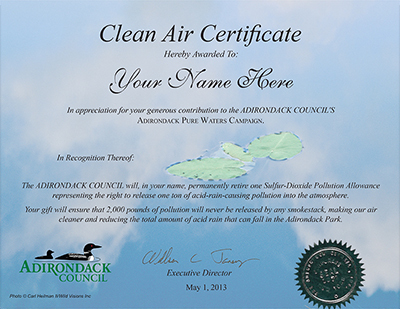 For a tax-deductible donation of $25 the Adirondack Council will permanently retire one ton of acid rain causing pollution. That means no power company will ever get its hands on it and one ton of acid rain causing pollution will never be released into the atmosphere, reducing the amount of acid rain that can fall in the Adirondacks. 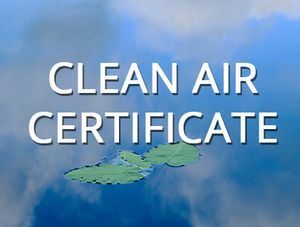 The Clean Air Certificate (8.5 x 11) can be can be made out in the name(s) of whomever you wish. FREE SHIPPING ON ALL CERTIFICATES!